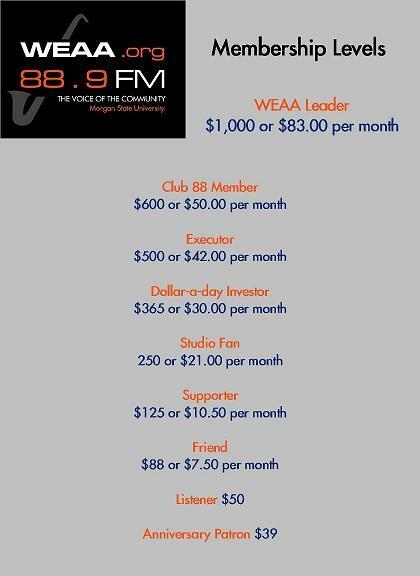 Be the "we" in WEAA 88.9FM and become a member today! When you join the WEAA Family, you join with tens of thousands of supporters who ensure that great radio remains accessible to everyone in our region and all around the world through weaa.org. There are many levels at which you can join, see below. Be a lifetime member for only $10, $20, $25 or more a month! Your ongoing, monthly contribution is the best way to support the music and specialty programming you love on WEAA 88.9FM. You’ll never have to worry about renewing until you contact the Membership Department to cancel. You will automatically receive a thank you gift on your anniversary date, on air recognition during the first day your anniversary pledge drive and other exclusive benefits. Be the first on your block to have the best new releases! Contribute $600 to join Club 88 and we'll send you a new CD every month for a year! Whether you prefer Reggae/World Beat, Gospel or Jazz, a new release CD hand-picked by WEAA’s own Program and Music Director, Marcellus Shepard, will be delivered to your door every month for a year. You can also become a member of Club 88 by making a sustaining monthly contribution of $50 per month, debited from your bank account or charged to a credit card, without expiration. That way, WEAA is able to put more of your dollars toward the music you love. WEAA Leaders are a special group of individuals and organizations who contribute at least $1,000 annually to WEAA 88.9 FM. As a WEAA Leader, you directly impact the longevity of our mission to provide the best in public radio content. The investment from our WEAA Leaders fund the production and broadcast of our news, public affairs, cultural, and music programming. For more information about becoming a WEAA Leader, contact Victor Holliday at 443-885-2075 or hollidayweaa@gmail.com. Click here to make your tax-deductible contribution securely online. Or, you can fill out the online WEAA Pledge Form and we will mail you a pledge reminder . Contact Victor Holliday, Interim Director of Membership at 443-885-2075.